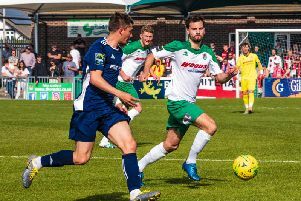 After the dull goalless draw in their opening match against Chatham, Bridges travelled on Tuesday night to Sittingbourne, who themselves had featured in a 3-3 draw at Cray Wanderers. On that occasion they had let a 3-1 lead slip, and in a mistake-littered match they let a 4-2 lead slip inside the last ten minutes. Bridges took the lead after six minutes when Callum Donaghey not only won an aerial duel but headed it on for Tony Garrod, who advanced before volleying past Simon Overland. But within two minutes trickery on the right by Remell Davies finished with an excellent cross and Miles Cornwall headed home the equaliser. Chances came at both ends but a minute before half-time came a rare mistake by Jamie Crellin as his header back to Kieron Thorp lacked pace and allowed Davies to lob the Brickies ahead. Within three minutes of the restart, a cross from Bridges Man of the Match Garrod found Devon Fender, whose initial effort came back off the post before he headed home. But on 58 minutes a corner from Steven Ita somehow eluded everyone bar Dan Tanner, who was virtually on the line as he knocked it home. And ten minutes later Steve Sargent’s back pass was too short. Crellin did his best to foil Davies but the ball ricocheted into the path of Cornwell for his second and Sittingbourne’s fourth. But with five minutes remaining of normal time, Ben Godfrey tapped a free-kick into the path of Sargent, whose 25-yard low drive went through a sea of legs for what still looked only likely to be a consolation goal. But, just as the sign for five additional minutes was shown, Godfrey hit a free-kick over the wall in the style of his Chelsea favourite Willian for a sensational equaliser. Bridges: Thorp, Sargent, Mobsby (Casselman 65), Bold, Cooney (Pulling 82), Crellin, Fender, Donaghey, Tait, Garrod, Lansdale (Godfrey 75).